The automotive industry is a wide range of companies and organizations involved in the design, development, manufacturing, marketing, and selling of motor vehicles. It is one of the world's largest economic sectors by revenue. The automotive industry does not include industries dedicated to the maintenance of automobiles following delivery to the end-user, such as automobile repair shops and motor fuel filling stations. The word automotive is from the Greek autos (self), and Latin motivus (of motion) to refer to any form of self-powered vehicle. This term, as proposed by Elmer Sperry[need quotation to verify] (1860-1930), first came into use with reference to automobiles in 1898. ✪ Who Owns What In The Automotive Industry? The automotive industry began in the 1860s with hundreds of manufacturers that pioneered the horseless carriage. For many decades, the United States led the world in total automobile production. In 1929, before the Great Depression, the world had 32,028,500 automobiles in use, and the U.S. automobile industry produced over 90% of them. At that time the U.S. had one car per 4.87 persons. After World War II, the U.S. produced about 75 percent of world's auto production. In 1980, the U.S. was overtaken by Japan and then became world's leader again in 1994. In 2006, Japan narrowly passed the U.S. in production and held this rank until 2009, when China took the top spot with 13.8 million units. With 19.3 million units manufactured in 2012, China almost doubled the U.S. production, with 10.3 million units, while Japan was in third place with 9.9 million units. From 1970 (140 models) over 1998 (260 models) to 2012 (684 models), the number of automobile models in the U.S. has grown exponentially. Safety in the automotive industry is particularly important and therefore highly regulated. Automobiles and other motor vehicles have to comply with a certain number of norms and regulations, whether local or international, in order to be accepted on the market. The standard ISO 26262, is considered as one of the best practice framework for achieving automotive functional safety. In case of safety issues, danger, product defect or faulty procedure during the manufacturing of the motor vehicle, the maker can request to return either a batch or the entire production run. This procedure is called product recall. Product recalls happen in every industry and can be production-related or stem from the raw material. Product and operation tests and inspections at different stages of the value chain are made to avoid these product recalls by ensuring end-user security and safety and compliance with the automotive industry requirements. However, the automotive industry is still particularly concerned about product recalls, which cause considerable financial consequences. Around the world, there were about 806 million cars and light trucks on the road in 2007, consuming over 980 billion litres (980,000,000 m3) of gasoline and diesel fuel yearly. The automobile is a primary mode of transportation for many developed economies. The Detroit branch of Boston Consulting Group predicts that, by 2014, one-third of world demand will be in the four BRIC markets (Brazil, Russia, India and China). Meanwhile, in the developed countries, the automotive industry has slowed down. It is also expected that this trend will continue, especially as the younger generations of people (in highly urbanized countries) no longer want to own a car anymore, and prefer other modes of transport. Other potentially powerful automotive markets are Iran and Indonesia. Emerging auto markets already buy more cars than established markets. According to a J.D. Power study, emerging markets accounted for 51 percent of the global light-vehicle sales in 2010. The study, performed in 2010 expected this trend to accelerate. However, more recent reports (2012) confirmed the opposite; namely that the automotive industry was slowing down even in BRIC countries. In the United States, vehicle sales peaked in 2000, at 17.8 million units. 1970s: Oil crisis and tighter safety and emission regulation. to 1950: USA had produced more than 80% of motor vehicles. 1950s: UK, Germany and France restarted production. 1960s: Japan started production and increased volume through the 1980s. 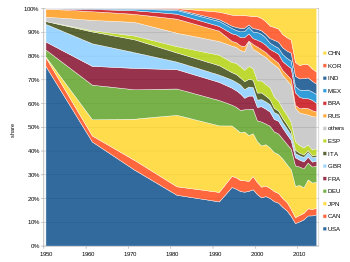 US, Japan, Germany, France and UK produced about 80% of motor vehicles through the 1980s. 1990s: Korea became a volume producer. In 2004, Korea became No. 5 passing France. 2000s: China increased its production drastically, and became the world's largest producing country in 2009 . 2010s: India overtakes Korea, Canada, Spain and UK to become 5th largest automobile producer. 2013: The share of China (25.4%), India, Korea, Brazil and Mexico rose to 43%, while the share of USA (12.7%), Japan, Germany, France and UK fell to 34%. 2017: The share of China (29.8%), India (5%), Korea (4.2%), Brazil (2.7%) and Mexico (4.1%) rose to 45.9%, while the share of USA (11.5%), Japan (9.96%), Germany, France (2.28%) and UK (1.79%) fell to 31.3%. The OICA counts over 50 countries which assemble, manufacture or disseminate automobiles. Of that figure, only 13, boldfaced in the list below, possess the capability to design automobiles from the ground up. This is a list of the 15 largest manufacturers by production in 2016. Daimler AG holds a 10.0% stake in KAMAZ. Daimler AG holds an 89.29% stake in Mitsubishi Fuso Truck and Bus Corporation. Daimler AG holds a 3.1% in the Renault-Nissan Alliance. Daimler AG holds an 85% stake in Master Motors. Dongfeng Motor holds a 12.23% stake and a 19.94% exercisable voting rights in PSA Groupe. FAW Group owns 49% of Haima Automobile. FCA holds a 10% stake in Ferrari. FCA holds a 67% stake in Fiat Automobili Srbija. FCA holds 37.8% of Tofaş with another 37.8% owned by Koç Holding. Fiat Automobili Srbija owns a 54% stake in Zastava Trucks. Fiat Industrial owns a 46% stake in Zastava Trucks. Fujian Motors Group holds a 15% stake in King Long. FMG, Beijing Automotive Group, China Motor, and Daimler has a joint venture called Fujian Benz. FMG, China Motor, and Mitsubishi Motors has a joint venture called Soueast, FMG holds a 50% stake, and both China Motor and Mitsubishi Motors holds an equal 25% stake. Geely Automobile holds a 23% stake in The London Taxi Company. Geely Automobile holds a 49.9% stake in PROTON Holdings and a 51% stake in Lotus Cars. Geely Holding Group holds a 9.69% stake in Daimler AG. Geely Holding Group holds an 8.3% stake and a 15.9% exercisable voting rights in Volvo. General Motors holds a 94% stake in GM Korea and SAIC Group holds a 6% stake. General Motors holds a 20% stake in Industries Mécaniques Maghrébines. Isuzu owns 10% of Industries Mécaniques Maghrébines. MAN SE holds a 17.01% voting stake in Scania. Marcopolo owns 19% of New Flyer Industries. Mitsubishi Group holds 20% of Mitsubishi Motors. Nissan owns 34% of Mitsubishi Motors and has since October 2016, thus having the right to nominate the chairman of Mitsubishi Motors' board and a third of its directors. Nissan owns 43% of Nissan Shatai. Porsche Automobil Holding SE has a 50.74% voting stake in Volkswagen Group. The Porsche automotive business is fully owned by the Volkswagen Group. Renault and Nissan Motors have an alliance (Renault-Nissan Alliance) involving two global companies linked by cross-shareholding, with Renault holding 43.4% of Nissan shares, and Nissan holding 15% of (non-voting) Renault shares. Renault-Nissan Alliance holds a 3.1% share in Daimler AG. Renault holds an 80.1% stake in Renault Samsung. SAIPA holds a 51% stake in Pars Khodro. Toyota holds a 100% stake in Daihatsu. Toyota holds a 50.1% stake in Hino. Toyota holds a 16.7% stake in Subaru Corporation, parent company of Subaru. Toyota holds a 5.9% stake in Isuzu. Toyota holds a 5.05% stake in Mazda, while Mazda holds 0.25% stake in Toyota. Volkswagen Group holds a 99.55% stake in the Audi Group. Volkswagen Group holds a 37.73% stake in Scania (68.6% voting rights), a 53.7% stake in MAN SE (55.9% voting rights), Volkswagen is integrating Scania, MAN and its own truck division into one division. Paccar has a 19% stake in Tatra. ZAP holds a 51% stake in Zhejiang Jonway. Beijing Automotive Group has a joint venture with Daimler called Beijing Benz, both companies hold a 50-50% stake. both companies also have a joint venture called Beijing Foton Daimler Automobile. Beijing Automotive Group also has a joint venture with Hyundai called Beijing Hyundai, both companies hold a 50-50% stake. BMW and Brilliance have a joint venture called BMW Brilliance. BMW owns a 50% stake, Brilliance owns a 40.5% stake, and the Shenyang municipal government owns a 9.5% stake. Changan Automobile has a 50-50% joint venture with Mazda (Changan Mazda). Changan Automobile and Ford have a 50-50% joint venture called Changan Ford. Changan Automobile and Jiangling Motors have a joint venture called Jiangxi Jiangling. Chery has a joint venture with Tata Motors called Chery Jaguar Land Rover, both companies hold a 50-50% stake. Chery and Israel Corporation has a joint venture called Qoros, both companies hold a 50-50% stake. Daimler AG and BYD Auto have a joint venture called Denza, both companies hold a 50-50% stake. Dongfeng Motor and Nissan have a 50-50% joint venture called Dongfeng Motor Company. Ford and Navistar International have a 50-50 joint venture called Blue Diamond Truck. Ford and Sollers JSC have a 50-50 joint venture called Ford Sollers. Ford and Koç Holding have a 50-50 joint venture called Ford Otosan. Ford and Lio Ho Group have a joint venture called Ford Lio Ho, Ford owns 70% and Lio Ho Group owns 30%. FAW Group has a 50-50 joint venture with Toyota called Sichuan FAW Toyota Motor and both companies also have another joint venture called Ranz. General Motors and Shanghai Automotive Industry Corporation (SAIC), both have two joint ventures in Shanghai General Motors and SAIC-GM-Wuling Automobile. Both also hold an equal 50% stake in General Motors India Private Limited. General Motors and UzAvtosanoat have a joint venture called GM Uzbekistan, UzAvtosanoat owns 75% and General Motors owns 25%. General Motors, AvtoVAZ, and EBRD have a joint venture called GM-AvtoVAZ, Both GM and AvtoVAZ owns 41.61% and EBRD owns 16.76%. Hyundai Motor Company and Kibar Holding has a joint venture called Hyundai Assan Otomotiv, Hyundai owns 70% and Kibar Holding owns 30%. Isuzu and Anadolu Group have a 50-50% joint venture called Anadolu Isuzu. Isuzu and General Motors has a 50-50% joint venture called Isuzu Truck South Africa. Isuzu, Sollers JSC, and Imperial Sojitz have a joint venture called Sollers-Isuzu, Sollers JSC owns 66%, Isuzu owns 29%, and Imperial Sojitz owns 5%. Mahindra & Mahindra and Navistar International have a joint venture called Mahindra Trucks and Buses Limited. Mahindra & Mahindra owns 51% and Navistar International owns 49%. Mahindra & Mahindra has a joint venture with Renault called Mahindra Renault, where Mahindra & Mahindra owns 51% and Renault owns 49%. MAN SE and UzAvtosanoat have a joint venture called MAN Auto-Uzbekistan, UzAvtosanoat owns 51% and MAN SE owns 49%. Navistar International and JAC has a joint venture called Anhui Jianghuai Navistar. Sollers JSC is involved in joint ventures with Ford (Ford Sollers) and Mazda to produce cars. Tata Motors also formed a joint venture in India with Fiat and gained access to Fiat's diesel engine technology. Tata Motors and Marcopolo have a joint venture called Tata Marcopolo, where Tata owns 51% and Marcopolo owns 49%. Volvo Group and Eicher Motors has a 50-50% joint venture called VE Commercial Vehicles. The table below shows the world's 10 largest motor vehicle manufacturing groups, along with the marques produced by each one. The table is ranked by 2016 production figures from the International Organization of Motor Vehicle Manufacturers (OICA) for the parent group, and then alphabetically by marque. Joint ventures are not reflected in this table. Production figures of joint ventures are typically included in OICA rankings, which can become a source of controversy. General Motors India stopped producing vehicles for the Indian market in 2017. It however continues to export vehicles to other markets. ^ Scientific and Technical Societies of the United States (Eighth ed.). Washington DC: National Academy of Sciences. 1968. p. 164. Retrieved 25 March 2014. ^ Harper, Douglas. "automotive". Online Etymology Dictionary. Retrieved 2018-10-16. ^ "U.S. Makes Ninety Percent of World's Automobiles". Popular Science. 115 (5): 84. November 1929. Retrieved 6 August 2013. ^ "2012 Production Statistics". OICA. Retrieved 6 August 2013. ^ Aichner, T.; Coletti, P (2013). "Customers' online shopping preferences in mass customization". Journal of Direct, Data and Digital Marketing Practice. 15 (1): 20–35. ^ "ISO 26262-10:2012 Road vehicles -- Functional safety -- Part 10: Guideline on ISO 26262". International Organization for Standardization. Retrieved 25 March 2014. ^ "Automobile Industry Introduction". Plunkett Research. 2008. Archived from the original on 19 December 2010. Retrieved 25 March 2014. ^ a b Khor, Martin. "Developing economies slowing down". twnside.org.sg. Archived from the original on 13 October 2012. Retrieved 21 July 2015. ^ "2014 Global Automotive Consumer Study : Exploring consumer preferences and mobility choices in Europe" (PDF). Deloittelcom. Archived from the original (PDF) on 2015-07-04. Retrieved 2015-07-03. ^ Eisenstein, Paul A. "Building BRIC's: 4 Markets Could Soon Dominate the Auto World". TheDetroitBureau.com. ^ Bertel Schmitt (15 February 2011). "Auto Industry Sets New World Record In 2010. Will Do It Again In 2011". The Truth About Cars. Retrieved 2019-04-06. ^ "Global Automotive Outlook for 2011 Appears Positive as Mature Auto Markets Recover, Emerging Markets Continue to Expand". J.D. Power and Associates. 15 February 2011. Archived from the original on 17 February 2011. Retrieved 7 August 2011. ^ "U.S. vehicle sales peaked in 2000". thecherrycreeknews.com. 27 May 2015. Archived from the original on 28 May 2015. Retrieved 18 June 2015. ^ "Table 1-23: World Motor Vehicle Production, Selected Countries (Thousands of vehicles)". Bureau of Transportation Statistics. May 23, 2017. Retrieved 2019-04-06. ^ "Arno A. Evers FAIR-PR". Hydrogenambassadors.com. Retrieved 2015-07-03. 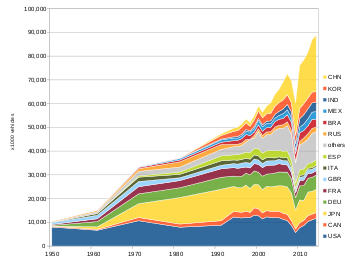 ^ a b "1998 - 1997 WORLD MOTOR VEHICLE PRODUCTION BY TYPE AND ECONOMIC AREA" (pdf). oica.net. Retrieved 21 July 2015. ^ "1999 Production Statistics". oica.net. ^ "2000 Production Statistics". oica.net. ^ "2001 Production Statistics". oica.net. ^ "2002 Production Statistics". oica.net. ^ "2003 Production Statistics". oica.net. ^ "2004 Production Statistics". oica.net. ^ "2005 Production Statistics". oica.net. ^ "2006 Production Statistics". oica.net. ^ "2007 Production Statistics". oica.net. ^ "2008 Production Statistics". oica.net. ^ "2009 Production Statistics". oica.net. ^ "2010 Production Statistics". oica.net. ^ "2011 Production Statistics". oica.net. ^ "2012 Production Statistics". oica.net. ^ "2013 Production Statistics". oica.net. ^ "2014 Production Statistics". oica.net. ^ "2015 Production Statistics". oica.net. ^ "2016 Production Statistics". oica.net. ^ "2017 Production Statistics". oica.net. ^ Jared Lynch, Mark Hawthorne (17 October 2015). "Australia's car industry one year from closing its doors". The Sydney Morning Herald. Archived from the original on 27 May 2017. Retrieved 27 May 2017. ^ "China's Geely to Acquire Stake in Malaysian Carmaker Proton". Bloomberg.com. 2017-05-23. Retrieved 2017-06-28. ^ "Nissan to take 34% stake in Mitsubishi Motors - BBC News". Retrieved 2016-07-01. ^ "Subscribe to read". Financial Times. Retrieved 2017-06-28. ^ "GM Slips to Number Two Worldwide, Ford to Fourth". The Truth About Cars. Archived from the original on 13 May 2010. Retrieved 2010-06-12. ^ "TTAC Announces World's Top Ten Automakers". The Truth About Cars. Archived from the original on 5 June 2010. Retrieved 2010-06-12. Look up automotive industry in Wiktionary, the free dictionary.